Crush the lemongrass stalks with the back of a knife, then cut them into small pieces. Slice lime. Add coconut milk, lemongrass, sliced lime, sugar, and coconut liqueur to a pot and bring to a boil. Let simmer for approx. 5 min., then remove from heat and let rest for approx. 30 min. Afterwards, strain the mixture through a fine sieve, let it drain, but don’t press it through the sieve! Add gelatin to a bowl and let it soak in water for approx. 5 min. Heat coconut mixture over medium-low heat. Press out gelatin sheets, add to the pot and heat while stirring until the gelatin is completely dissolved. Fill mixture into cold ramekins and refrigerate for approx 4 hrs. Peel and finely dice mango. Set aside some diced mango for serving, add the rest of the mango to a pot and blend, using an immersion blender, until smooth. Set the pot over medium-low heat to warm the mango sauce through. 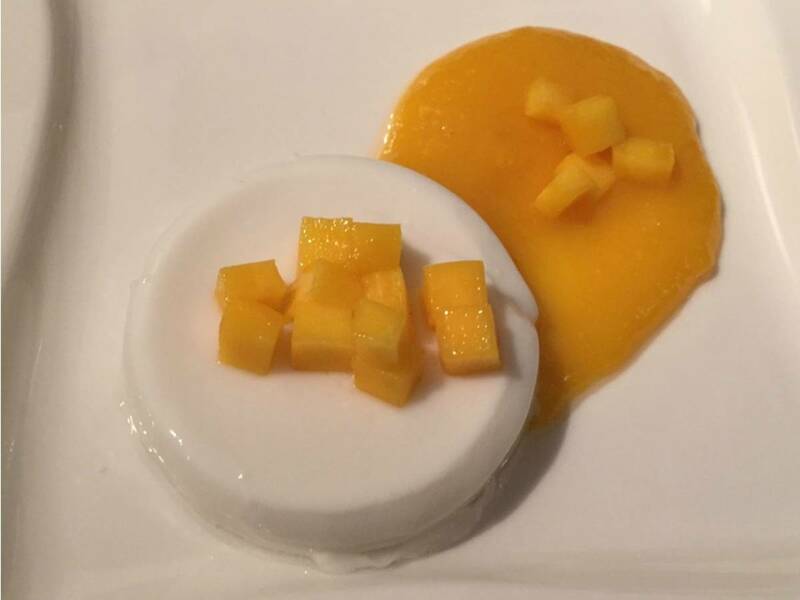 To serve, spread some mango puree on a plate, then place panna cotta on top, and garnish with remaining diced mango. Enjoy!